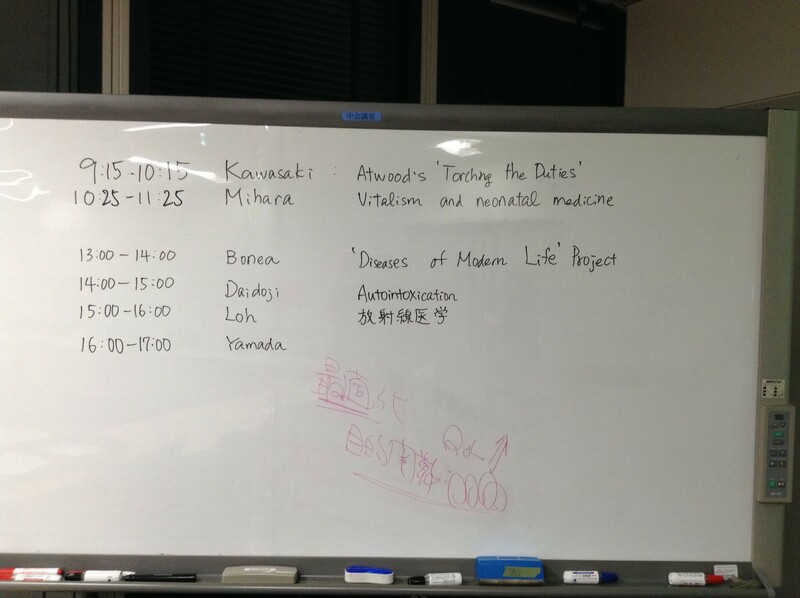 On 17 September 2015, in the course of a research trip to Japan, I had the pleasure of joining Prof Akihito Suzuki and a number of early career researchers at Keio University for what turned out to be a very stimulating ‘Workshop on the History of Medicine, Society and the Body’. The event has become an annual tradition, an opportunity for scholars of the history of medicine to exchange ideas in a congenial setting and, equally important, in a language other than their mother tongue, thus either English or Japanese. My own role in the workshop, as you can see from the illustration below, was to introduce the work of the ‘Diseases of Modern Life’ Project as well as my research on technologies of communication and health in the nineteenth century. In case anyone was wondering whether our nineteenth-century predecessors (also) suffered from repetitive strain injuries as a result of excessive writing, typewriting or telegraphing, the answer is ‘Yes, they did!’. 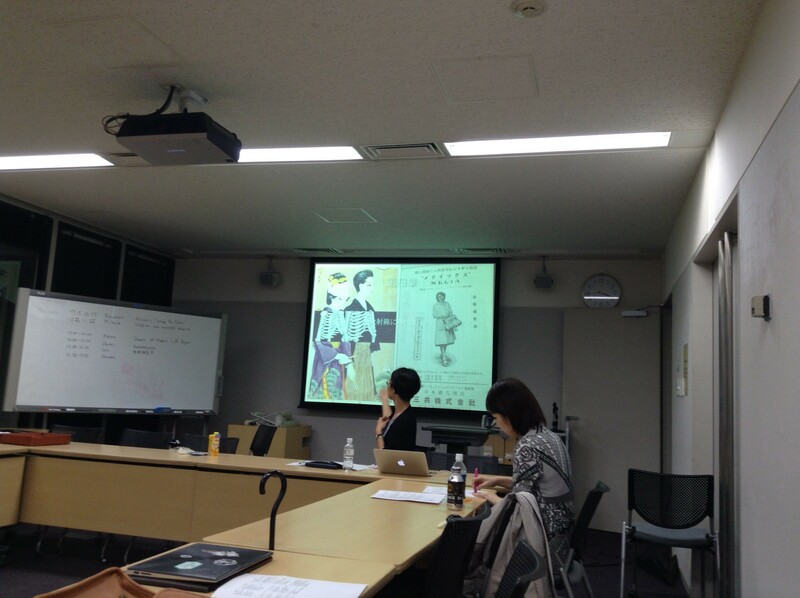 The first speaker was Dr Akiko Kawasaki (Komazawa), whose talk on “Charles Bonnet Syndrome in Margaret Atwood’s ‘Torching the Dusties’” examined the story of an elderly couple, Wilma and Tobias. The two are trapped in a luxurious nursing home, Ambrosia Manor, which becomes the target of a violent mob of young people known as ‘Our Turn’. Atwood’s story, as Kawasaki pointed out, is set against the background of contemporary debates about generational inequality in Canadian society and is a moving account of physical and mental degeneration in old age. The angry protesters that besiege Ambrosia Manor wave placards with disturbing slogans like ‘Hurry up please, it’s time’ and ‘Torch the Dusties’. Wilma’s experience of the attack is mediated by her physical disability: her memory is fading and she suffers from age-related macular degeneration and Charles Bonnet Syndrome (CBS). This leads to several bouts of visual hallucinations, in the course of which she sees colourfully dressed little people or ‘manikins’ dancing around her room and ‘putting on a grand show for her’. The use of CBS, Kawasaki argued, helps to blur the boundary between reality and imagination, leading to overlaps between Wilma’s reality and the reality of the outside world, and ‘creat[ing] a dramatic life-or-death moment’. Sayaka Mihara’s (Keio) talk on ‘Vitalism and Neonatal Medicine in Japan, 1900-1940’ introduced us to the history of conception and clinical management of debilitas vitae (seiryoku hakujyaku 生力薄弱). Her analysis showed that although the European notion of ‘congenital debility’ (sentensei jyakushitsu 先天性弱質) was accepted in Japan in 1899 in the field of death registration, the concepts of debilitas vitae and ‘vital force’ (seiryoku 生力) resonated more with Japanese paediatricians due to the influence of Rangaku (Dutch) learning and of Chinese qi cosmology in nineteenth-century Japan. Furthermore, Mihara discussed how Japanese doctors attempted to treat debilitas vitae with the help of physical and chemical methods (incubators between 1900 and 1930, and hormone therapy and gavage feeding from 1930 until 1945, respectively), despite the fact that vitalism advocated a ‘distrust [of] the power of technique over life’. 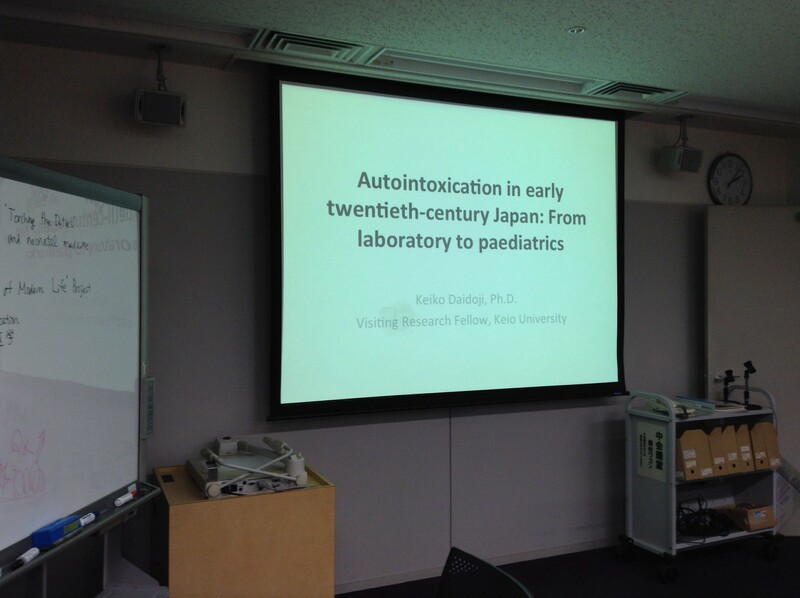 Dr Keiko Daidoji (Keio) traced the history of autointoxication in early twentieth-century Japan and its transformation into a psychosomatic disorder of Japanese children. She discussed the influence of Nobel-prize winner Ilya Ilyich Mechnikov (1845-1916), whose research on the nexus between disease and the toxins produced by intestinal bacteria shaped understandings of autointoxication in Japan. This was reflected, for example, in the work of the Japanese doctor Yumoto Kyūshin on neurasthenia, which combined the emerging notion of ‘toxin’ of European medicine with that of poison or doku found in medical writings of the Edo period. In the same time, Daidoji also showed how, during a period marked by growing concern with ‘constitution’ in Japanese medicine, other doctors came to regard autointoxication as a ‘constitutional anomaly’, by positing a connection between the accumulation of poison in a person’s body and their ‘constitutional type’. Loh Shi-Lin’s (Harvard) talk traced the development of radiology in modern Japan, from Bunryo Marumo’s first lecture and demonstration of Roentgen’s apparatus on 31 May 1896 to the introduction of an X-ray instrument in the Laboratory of Anatomy, Department of Medicine, at the Tokyo Imperial University in the following year to the marketing of X-ray devices by the Yasunaka Denki Seisakujo (Yasunaka Electric Factory) a mere four years later. Loh’s talk reconstructed the multi-faceted life of X-rays in modern Japan, showing how advocates of this technology envisaged its application in a wide range of fields, including the army, the industry and for the general public. Print culture provides some fascinating examples of the latter. Here, Loh discussed the use of X-rays to screen potential marriage partners for tuberculosis, as the illustration below also shows. Rie Yamada’s (Tokyo) talked focused on psychiatric health care in contemporary Japan, contrasting the Japanese system with that of other European and North American countries and pointing out, for example, that there are differences in the definition of psychiatric beds and that Japan has the highest number of days of hospitalization. Her ongoing doctoral research on this topic takes place in the context of a recent move by the Japanese Government to deinstitutionalize the care of people affected by mental illness by shifting responsibility from hospitals onto the community, as reflected in the 2004 plan to reform mental health and welfare services. The family is thus central to Yamada’s research; a good portion of the material she analyses comes from publications originating with associations of the patients’ families as well as interviews with family members, nurses and doctors. Her research into this topic is a welcome addition to a more substantial body of scholarship which has examined the care of elderly people in contemporary Japanese society.